It took us a little longer than usual to pack up this morning as we found a pool of water in our metal food box, which is secured to the side of the sidecar. It must have got in during the all-day/all-night storm of two days ago, in spite of the robust seal provided around the box’s hinged lid. So, we had to empty it, dry it out and re-pack. My helmet, despite being under the sidecar’s tonneau cover, had also got damp inside. Since I didn’t relish the idea of putting on a wet helmet, I spent a bit of time drying it with my hairdryer! The ride to Punta del Diablo, once we got going, was very interesting despite being along a straight, flat road. Hundreds of palm trees lined the road and every so often there were great numbers grouped together amongst pampas grasses growing over vast areas of grassland, with sheep and cows grazing. We reached our destination in the late afternoon and started to look for somewhere to stay. We’d previously looked on booking.com but I hadn’t seen anything suitable. I really wanted to stay in a cabana (cabin) with a sea view, as this area is noted for its extensive, attractive beaches, with waves which are particularly good for surfing. We stumbled upon a small Posada (Roadside Inn) which had several available cabanas with an amazing, uninterrupted view of the Atlantic Ocean. Under the guise of wooden cladding, we very quickly realised they were more storage containers in disguise, but the view made up for their compactness! We decided to stay for several days as we had a good decking area complete with hammock, plus a good few days of predicted sunshine. Today was mainly spent sitting on the decking in the sunshine, doing crosswords, and Mark sleeping in the hammock. However, we did venture out to have a walk around the town and along the beach. Many houses here are thatched, similar to Punta del Este, as there are many areas of marshland along the coast where reeds grow, which are used for roof coverings. Whilst walking around the town, we also saw many interesting and colourful cabanas, hostels and houses on stilts. In the summer (January and February), apparently this small fishing village of 900 inhabitants swells to 30,000, so we’re pleased to have missed the busy period – the town is relatively peaceful now. Uruguay has recently legalised the use of Cannabis which can be bought from pharmacies for one’s own use, or one can grow up to 6 plants for personal use, but cannot be sold on to a third party. We noticed ‘special’ brownies being sold on some of the street stalls, which we may well try tomorrow…. as if brownies aren’t pleasurable enough when they are just normal! Another lovely sunny day was spent lazing around on our decking and on the beach, which is just a minute from our cabana. We watched a fishing boat land its catch, with many people appearing from nowhere to help drag it up the beach and turn the winch. Then, large polystyrene boxes were filled with the fish and taken to several shacks along the beach road where they were gutted and sold to the general public and local restaurants. We decided to eat in one of the restaurants and chose the fresh fish – we weren’t disappointed. Sadly though, the Brownies weren’t on sale today! We decided to stay another night as we couldn’t think of anywhere better to be than here in the sunshine! I woke up early to the sound of a car alarm – the sun was just rising, so I sat on our decking and watched the sun rise up over the sea. Mark later checked over the bike as we will leave for Brazil tomorrow morning. It is a short ride to the border at Chuy, some 25 miles away. We spent the day reading and people-watching on the beach. There were several kite surfers close-by who were very skilled at keeping on their boards when it became very windy in the afternoon. It was incredible how high they flew out of the water, and how they managed to miss the dozen or so swimmers close-by in the water! We negotiated our way out of Montevideo and headed eastwards along the coast on Ruta 1 to Punta del Este, about 100 miles away. Punta del Este is an upmarket coastal resort which is very popular as a holiday destination for the rich and famous from Argentina and Uruguay. Huge, stylish apartment blocks and hotels lined the road into the town and we noticed that a round of the Formula E Prix was taking part here today. We stopped off at the harbour area which had many expensive restaurants along the seafront – not really our sort of place, especially when we checked the price of a beer and saw it was equivalent to £7 each! We decided to move on a few miles to a spot where we’d seen a campsite on i-overlander, which suited us much better. We were diverted off the main coastal road because of the Formula E race, but found our way there with no problem. The campsite was situated in an attractive pine forest and had good facilities. Now being out of the high season (January and February), it was largely empty. We pitched the tent with some slight concern regarding the weather forecast since an electrical storm was predicted for that evening. Unfortunately, the weather forecast was extremely accurate as the storm lasted all night and today until around 8pm, when the rain finally eased up. We have never before experienced a storm such as this one, with constant, uninterrupted thunder and lightning. The campsite was at one point completely flooded, with rivers of water running around our tent, but luckily we remained dry in our tent and looked forward to the sunny day predicted for tomorrow. We woke up to a morning of mixed cloud and blue sky, but a full sun appeared by late morning which gave us a chance to dry some things which we’d forgotten to take off the bike and had consequently got a bit damp from yesterday’s rain. The sun appeared this morning, after yesterday’s storm. Only a few small branches landed on our plot overnight! After lunch, we walked down to the beach and enjoyed looking at the houses on the quiet residential roads leading there. The houses were similar to many English styles, including a number of thatched houses – the first we’ve seen in South America. Most of them appeared to be holiday homes and were all well-maintained with large, well-tended gardens. The whole area seemed very exclusive and a contrast to the majority places we have seen. The beach extended as far as the eye could see, with the high-rise buildings of Punta del Este on the horizon. We found a sheltered spot to sit amongst the sand dunes, out of the wind, and were the only people on this part of the beach. The highlight of the day for Mark was spotting his favourite car, a Citroen Mehari which was probably 30 years old, but had stood the test of time, and was still in fairly good condition for its age. Tomorrow we will head further northeast to Punta del Diablo, another coastal resort which is, apparently, far more low-key than Punta del Este. Our ferry to Uruguay was booked for 12.00, which we thought would give us plenty of time to check-in and just as well as the directions to the port were non-existent until we were practically outside it! Several diversions and no- through roads made it extremely frustrating and we had to pull over several times to check where we were. It was then that a friendly guy driving a Renault Duster pulled over and offered to take us there following him. He had a Harley Davison sticker on the back of his car as well as two ‘Islas Malvinas son Argentinian’ stickers (Falkland Islands are Argentinian) – we wondered if he had seen the GB sticker on the back of our sidecar! Anyway, we were extremely grateful to him and we considered ourselves lucky that motorcyclists, wherever you are, always seem to go out of their way to be friendly and helpful. Checking-in was also somewhat confusing and after going through passport control for both Argentina and Uruguay, and handing in the bike import permit to the Aduana (Customs), we then had to board the ferry separately. Mark had to stay with the bike and I had to go upstairs to a passenger waiting room and board from there. This was a somewhat anxious situation for me as I had thoughts of something happening to Mark or the bike, with me ending up in Uruguay alone! However, it was all fine and we met-up on the ferry and found a seat by the window for the short one hour crossing over the Rio de la Plata to Colonia del Sacramento in Uruguay. Once landed, we had to find the Aduana again and get a new bike import permit for Uruguay. We were the only people needing one of these permits. Th Aduana official was extremely friendly and helpful, which is not always the norm. I stayed with the bike whilst Mark took the documents and followed him into the building. When Mark got back it turned out that the customs man had visited the UK last year and had been to Dover Castle and had also seen the famous White Cliffs! For anyone reading this who doesn’t know us, Dover is only about 8 miles from our home in the UK, so quite a co-incidence that he should have spent his holiday there! We found the place we had booked for the night in Colonia del Sacramento fairly easily, as it was on the outskirts of town. It wasn’t quite what we were expecting as it turned out to be a converted storage container! Despite being a bit cramped, it was fine for one night. There was a huge electrical storm last night which continued into the early hours of the morning. Today though, it was still cool and windy but luckily the sky was mostly blue, and the forecast was for sun. We headed into Colonia town centre as it has an UNESCO heritage status – there are old, attractive buildings and cobblestone streets, a legacy left from previous Spanish and Portuguese influence. After a short tour of the town we headed off towards Montevideo along an extremely straight road edged with attractive palm trees for what seemed like miles. 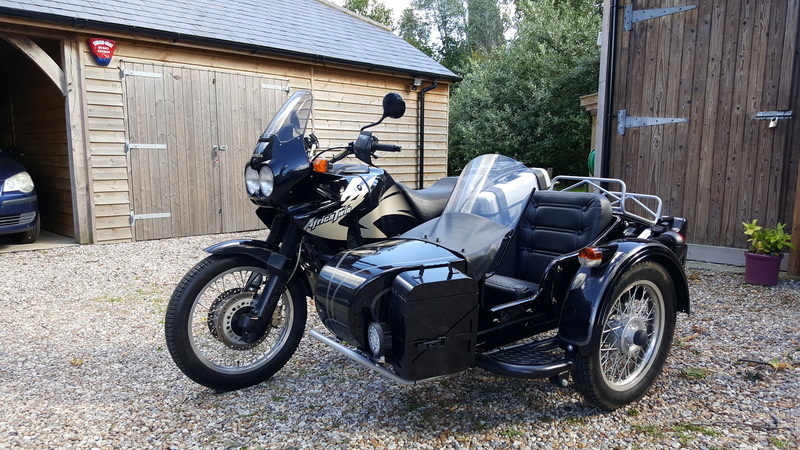 We’re still getting much attention with the sidecar, in particular when we stop at service stations for fuel and food. Today was no different when we chatted to several Brazilian motorcyclists, and within 15 minutes had offers of accommodation, telephone numbers if we needed any help, and suggestions of interesting places to visit and interesting roads to ride. Our plan is to get to Brazil and then head back to Buenos Aires and home. Montevideo, the Capital of Uruguay, is its largest city and has many museums and other places of interest, some of which we’ll check-out tomorrow. I also want to experience a Tango dance evening, so we’re booked into ‘Baar Fun Fun’ this evening. It’s been running since 1895 and serves food, local wine known as ‘Uvita’, and has an atmospheric stage where the performances take place. Mark isn’t quite so excited about it all! Well, we had a fantastic evening last night and enjoyed several Tango dancing displays, as well as a vocalist accompanied by a guitarist who sang local folk songs that everyone in the bar seemed to know all the words to (except us). It was a great atmosphere and we had good food as well. Having had to initially drag Mark to the venue, I had to practically drag him away as he enjoyed the evening so much! I tried the Uvita, which was very similar to sherry. This morning we visited the Museo Andes 1972, not far from our Hotel. It’s the museum dedicated to the plane crash in the Andes after which some of the passengers survived by two of them trekking over the freezing mountains to raise the alarm, many weeks after rescue searches had been abandoned. We spent several hours wandering around the displays, watching videos where survivors described their experiences, and chatted to the curator who knows some of the families involved. It was all very interesting and afterwards we walked around the city shops, down to the river and then looked inside the Metropolitan Cathedral which was very ornate and beautiful. Tomorrow we are moving on to Punta del Este which is a well-known (at least to South Americans), exclusive beach town about 100 miles along the coast, eastwards. Now the holiday high season has ended, we’ll hopefully have no problem finding somewhere to stay. However, first, we’ll look for a new rear tyre for the bike whilst in Montevideo as it’ll be harder to find one when outside the city. It still has some tread left, but realistically only has around 500 miles before replacement will be needed. We were sad to leave Posada Maestossa as it had been so comfortable and relaxing, but we needed to move on and get to Buenos Aires. It had rained overnight and was overcast as we set off, but soon warmed up and we made good time despite a poor road surface. Large pot holes and ruts again covered our route till we reached Rosario, which amazed us as it was the main autoroute from Cordoba to the capital, Buenos Aires! The main autoroute to Buenos Aires! Rosario had originally been our destination for today as it was the birthplace of Ernesto ‘Che’ Guevara. He became a revolutionist after travelling around South America in 1952 on a 500cc Norton motorcycle with his friend, Rodrigo de la Serna. They witnessed the poverty of peasants, miners and ostracized lepers and it had a dramatic effect on him, so by the end of their trip he was prepared to fight and die for the cause of the poor. Their experience became the subject of his book, ‘The Motorcycle Diaries’ (which we must read again when we get home). However, we found out there’s no Che Guevara museum in Rosario – only his house which is now a private residence with no admission – so we decided to press on to Baradero, a town some 50 miles closer to Buenos Aires, where we found a modest but decent hotel for the night. The road to Buenos Aires was straight all the way, running through very mundane scenery compared to what we’d been used to riding through over the last few months. When we arrived, we rode along the busy by-pass and into to the city centre. We’d booked an ‘Aparthotel’ (a small apartment with hotel facilities such as breakfast, room cleaning etc.) for two nights to give us time to arrange a ferry crossing to Uruguay and to do a bit of sight-seeing. We’ll be returning to Buenos Aires when we reach the end of our trip, so may have time to see more of the city then. The view from our apartment….not quite as good as some we’ve had! We spoke with the helpful concierge at reception, who offered to print the on-line ferry tickets we’d bought, so we are off to Uruguay tomorrow morning! We spent the day walking the city and clocked up around eight miles, which was quite exhausting in the heat. Our destination was the Jardin Japones (Japanese Garden) which is apparently the biggest garden of this type outside Japan. It was a very peaceful place with Koi Carp swimming amongst the water lillies in the extensive ponds, red painted bridges, and winding gravel paths through the gardens. Buenos Aires is a very pleasant city and seems to be very westernised, say compared to Santiago where we’d spent a week a month and a half ago. The walk to the Japanese Garden reminded us of being in central London in many respects. The old, Colonial buildings are impressive, with many having beautiful, ornate mouldings. They all seem to be well maintained, which is another notable difference to most other places we’ve visited. The streets were clean, with very little rubbish evident, but there were still many impatient drivers and loads of people jostling for space on the pavements! The weather was overcast this morning as there’d been heavy rain overnight which continued into the early hours. The main road out of town, Ruta 40, had flooded in places and was a bit treacherous where muddy water had been washed down from the hills to the west and over the road, making it slippery. The road is actually designed with a number of wide gulleys running across it so that the muddy water is channelled into the ‘Valley of the Cacti’, on the other side. This meant that small fords had appeared at many of the gulleys, which we of course had to ride through. At one point, we passed several work men clearing the road with a digger. Judging by the amount of soil piled up at the roadside, we imagined that the road could well have been blocked earlier. We soon turned off Ruta 40 and rode on towards Cordoba along a secondary road, Ruta Provincial 357/307, to Tafi del Vallee, a small town in the middle of the far eastern part of the Andean foothills. The road was paved, but was the worst example of paving we’ve come across so far, and looked about a hundred years old! It had become cracked to such an extent that it resembled crazy paving rather than tarmac, with the bits of tarmac between the cracks being badly eroded as well. Out of sympathy for the bike, our speed dropped to between 15 and 30mph, depending on how bad the surface was. As we climbed up out of Cactus Valley, the rains returned and the cloud was so low that we were riding right through it, with visibility down to a minimum. We arrived at Tafi del Valley in the early afternoon having covered only 80 miles, and stopped here for a lunch of Locro, a local type of stew. After lunch, we started to descend into the lowlands which run all the way to the Atlantic coast along Rutas 157, 60 and 9. The road surface was now good and we had to negotiate the never-ending hairpin bends which in any other situation would have been fun, but not today since we were riding through torrential rain (and had to stop for the first time in months to put on our waterproofs). When we eventually finished riding the hairpins, the rain stopped, and the weather started to improve. Whilst the road had improved by now too, there were still the inevitable animals to watch out for and today we had to stop several times for herds of goats, cows and horses which were roaming in the road despite some being managed by horsemen, also known as a Gauchos. We eventually reached San Pedro Guasayan, where we decided to stay for the night. In fact, we had little choice since the next town where there would be accommodation was fifty miles away. When we saw a sign advertising the hotel in San Pedro, we were expecting to see a run-down hostel since most of the buildings in the small towns we had ridden through were fairly grim, but we were pleasantly surprised! It was a fairly new, sizable hotel with a thermal spa pool outside, which unfortunately we didn’t get to use. It had the feeling inside of being in a university hall of residence, especially in the restaurant, and was more than fine for one night. The weather was much improved today and we made good time as the road surface remained good. The landscape was much flatter and the road was straight almost continuously. We rode through several different types of landscapes – first, lush greenery similar to home; then a return to desert-like scenery with sand and cacti; then an expanse of salt flats; and finally more green landscape again very similar to the UK. We’d now entered the vast, low-lying area known as the Pampas. We stopped at a service station in the late afternoon to use their Wi-Fi, to check-out hostels in Cordoba. After browsing for a while and finding nothing suitable, we decided to take a chance and stop on spec. This turned out to be a bad decision as the city was busy and it was difficult to park on the narrow streets outside prospective places to stay. Anyhow, we eventually found a hostel, with a 24-hour secure parking lot a short distance away. Cordoba is Argentina’s second largest city and in our opinion not the most attractive! We saw a few interesting old Colonial buildings in some of the side streets, and the cathedral fronting the main plaza is spectacular inside, but many of the buildings we found rather mundane. We walked a mile or so to the central park where we had some tasty street food, and then walked back to a bar on the plaza for a cold beer and people-watched for a while. The national drink in Argentina is Fernet, a strong medicinal-tasting herbal liquor which is always mixed with coke, so we will have to try it and compare it with the Pisco Sours of Chile! We returned to the Hostel late afternoon as it was too hot to be walking around the city for too long. There was a cool breeze on the roof top terrace and it was from there that we heard the noise of a demonstration outside, very near the hostel. We had heard that it was ‘International Women’s Day’, so we guessed it was something to do with that. We went to investigate. There was a huge march along a nearby main road, with a variety of banners and the marchers singing and chanting through loud hailers. There were also many trades union banners, and we could hear that they were demanding equal pay for women. We packed-up and left the Hostel by 11.00. Hostel Aldea hadn’t been the best hostel we’d stayed in, but certainly not the worst. Maybe we should avoid ‘back packer’ hostels in the future! All the breakfast had gone by 9.30 yesterday (it finished at 10.00), and despite being told someone had gone for more bread, it never appeared, so we didn’t bother with breakfast this morning. We exited Cordoba relatively easily albeit the signage was non-existent, and the off-line GPS map wanted to take us around in circles! At many of the road junctions there are no give-way signs or road markings (as in all other towns too), so it seems to be a free-for-all and could be potentially rather dangerous. Anyway, we found the city ring-road that took us to the autoroute for Buenos Aires and headed for the first service station to fill-up the tank and have breakfast. In Argentina there are many Police check points. We were stopped a few days ago when they checked our passports and documentation, and again today! The Police Officer today indicated that I wasn’t wearing a seat belt in the sidecar. In fact, we don’t have a seat belt fitted as it is not a legal requirement in the UK. After a discussion with his colleague he let us move on, but it did cross our minds that we may have to pay a fine/bribe, as we’ve heard a lot about such incidents involving the transport police from other travellers we’ve met. The weather was in the mid-30’s and, unusually, hot even when riding along at speed. Whilst having lunch at a filling station, we decided to pre-book somewhere to stay for the night, preferably with a pool and with a bit more luxury than the last hostel! We found ‘Posada Maestosso’ on booking.com and reserved our room as the hotel had a nice-looking swimming pool and was only a short ride away. When we checked-in, it was so nice that we decided to stay for 2 nights since the forecast for the next day was stating 36 degrees and we could spend a whole day lazing by the pool…..sorry to those who are reading this from a very cold UK! We were the only people at the pool when we got there in the late afternoon. We cooled down on sunbeds in the pool, which was surrounded by palm trees, and stayed there until the sun went down.…luxury! As mentioned above, we’re spending the day at our hotel, catching up with this blog, checking the finances and extending our bike insurance, and taking it easy by the pool! Cafayate is a picturesque town with a central plaza which has numerous small artisan shops, restaurants and an impressive church surrounding it. We had an enjoyable stroll around, including one of our usual visits to the town’s church (which is almost always on the plaza) and ended up at El Rancho restaurant for lunch, as recommended by Trip adviser. We had a few very tastey meat empanadas (similar to Cornish pasties) which are much smaller and meatier than those we had in Chile, and a local dish, Locro. This is a hearty stew which is popular in the Andes, and is a national dish of Argentina, Bolivia, Peru and Equador. It consists of corn, beans and potato or pumpkin soup and some type of meat….not exactly sure what meat, but could have been goat! As we left the restaurant, we chatted to two U.S. bikers who’d stopped at our restaurant for lunch. They were part of a nine-person group travelling in an organised tour over a period of two months. They were waiting for the others to catch up, and when we mentioned that we were travelling with a sidecar they told us us there were not one but two sidecars in their group, which were behind them, but would be along shortly. They had started their trip in Cartagena, North Columbia, and had then travelled through Equador, Peru and Bolivia before reaching Argentina. The person leading this group through South America was Helge Petersen, who spent ten years travelling the world many years ago, and is now in his seventies. He has written books about his travels and still contributes to many adventure bike publications and organises bike tours through his company, Globe Riders. We spoke to him for a short while, but they still had a fair way to go before stopping for the night, so had to set off again. It was interesting to see that the sidecars were like to ours. One of them was exactly the same, a Russian Ural, whereas the other was modelled on the Ural, but had a body constructed from glass fibre rather then steel, and looked slightly longer. Both were fitted to big BMW’s, an older 1150GSA and a more modern 1200 GSA. The only other sidecars we have seen so far were several weeks ago in El Bolson – two were parked-up next to a café and we made a point of chatting to their Argentino owners. Sidecars are a very rare sight in South America, as all the attention we still get highlights! It was day 100 of our trip today! Time is going too quickly, but we’ll still see much more of Argentina as we now begin to head south-east towards Buenos Aires and Uruguay, before we return home towards the end of April. Today, we had another co-incidence in the town. Mark saw three guys walking along the street, who’d sat at the next table to ours in Salta a few days ago. So we stopped, greeted them, and chatted to them for a while and found out that that they all lived in London. Then, even more co-incidentally, one of them spotted his next-door neighbour from home (Kennington) walking along the street! They’d both known that they were both visiting the general area, but certainly didn’t expect to bump into each other in a back street in Cafayate! Cafayate is a well-established wine growing region, producing both red and white wines, the most popular being a white called Torrentes. There are also local farms producing goats cheese, and we’ve noticed numerous small stalls and posadas (small cafes with rooms) selling these products along the roadside. So, we were very fortunate to spot a place just on the outskirts of the town that sold both, which we walked to from our Hostel. We’d read that this vineyard had been in production for over 100 years, but several years ago they had noticed a demand in the town for goat meat and cheese, and had therefore decided to rear their own goats on grapeseed oil, corn, barley and oatmeal, and in return they could use the goat droppings to fertilise the soil for the grapes. So, the meat, cheese and wine are all organic. We enjoyed our walk to the farm, a couple of kilometres along a sandy track through the vineyard. As we’d missed the last tour of the morning, we were able to wander over to the goat pens on our own. All the goats seemed very well looked-after and friendly. We bought a goat cheese in the small farm shop and then, on the way back to our hostel, bought a bottle of Torrentes, some bread, tomatoes and avocado for lunch….perfecto! In the afternoon, Mark checked over the bike – sidecar bolts, engine oil, cooling fluid, tyre pressures etc. since we’re leaving here tomorrow morning and will head towards Cordoba which is en-route to Buenos Aires, which is around 900 miles to the south east, and Uruguay beyond. We’ve updated our route map which you’ll see below. We’ve also now included a dedicated map page which can be accessed via the menu. We left Salta in the morning and headed towards Cafayate, approximately 120 miles away. The traffic was chaotic leaving the city, but we soon found Ruta 68 which would take us all the way there. We pulled over at a nice roadside café for lunch, sitting in their garden next to huge, fruit-bearing cacti. We again drove through some magnificent landscapes, which at times were so outstanding that we just had to stop to admire the views and take yet more photos, most of which I take from the sidecar as we ride along. Since we’re only using a Samsung Galaxy mobile phone, we’ve been really impressed at how well they’re coming out. Once at Cafayate, we found Hostal Cabanitas Del Suri which our i-overlander app had recommended. It’s towards the edge of the town in a nice quiet area, but only 2 blocks away from the central plaza. The hosts were very friendly, and we spent a while talking about our travels and the sidecar before unpacking and settling-in. We’ll probably stay 2 nights here as it’ll be nice to spend a bit of time in the area. To our amazement, there was a minor thunderstorm shortly after we’d unloaded the bike, but apart from the rain in Salta 3 days ago, the last rain we had was back in December! Now we’re back in Argentina, we’ve noticed the return of the ancient French cars we saw when in Patagonia, in particular Peugeot 504’s (Mark’s parents had one of these in the 1970’s), Renault 12’s, and also some Fiat 127’s.